With 72% of Gen Z/Millennials saying they have driven over 100 miles to attend a live music event, it's no surprise music serves as a connector in today's digital world. Now, Live Nation and research agency Culture Co-op are revealing findings from their global "Power of Live" study that tracked 22,500 live music fans, from 11 countries, ranging ages 13 to 65. Three in four respondents (73%) say that now want to experience real life rather than digital life. It isn't just about the two-hour concert. Nearly eight in 10 (79%) says the experience extends beyond the event, with 65% making a purchase specifically for the concert and 68% sharing on social media. Music may also strengthen brand affinity, since the report finds emotional intensity of live music opens the mind to new ideas. Two in three (67%) say the more emotionally engaged they are, the more open they are to new ideas. 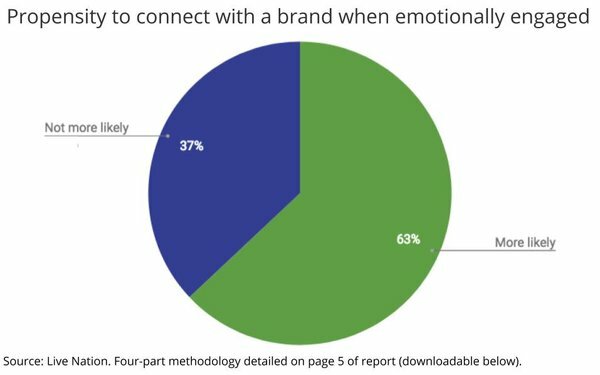 In fact, 90% said brands are welcome in the space as long as they find authentic ways to enhance their experience. Live Nation recommends brands seeking brand engagement need to be culturally relevant, mutually beneficial, stand for something build strong bonds, especially when their aligned values are center stage. "Live music is a feed of unforgettable moments," states the report. Despite today's divided culture, respondents said music drives identity more than their hometown, politics, race or religion. The only things that are a bigger force than music are friends/family and pastimes.